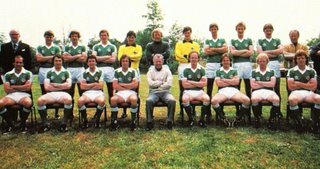 Back Row: Jack Balmer (medical consultant), Mal Donaghy, Gerry Armstrong, John O'Neill, George Dunlop, Eric McManus, Jim Platt, Chris Nicholl, Billy Hamilton, John McClelland, Bobby McGregor (physio).Front Row: Tom Finney, Tommy Cassidy, Terry Cochrane, Sammy McIlroy, Billy Bingham (manager), Noel Brotherston, David McCreery, Derek Spence, Jimmy Nicholl. 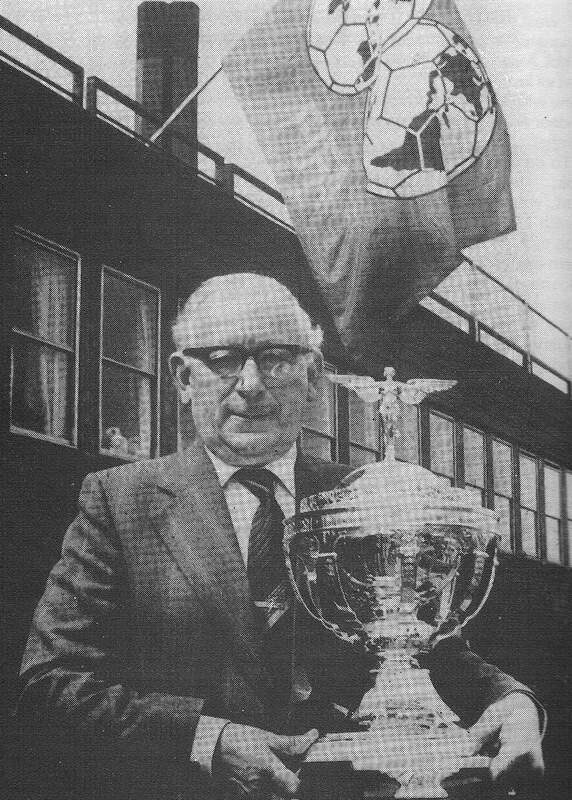 Harry Cavan, President of the Irish FA and Vice-President of FIFA, with the British Championship trophy outside the Maysfield Liesure Centre, Belfast, which hosted part of the IFA Centenary Exhibition. I will never forget the thrill of that win in 1980. It was the first silverware won by my favourite team in my lifetime. I was also thrilled that my wee brother was in Cardiff to see the lads finish the job. Magic!